Article written by Joely Pope, a recent graduate of the dual MAAA/MPA program at SPEA. Joely has been in Bloomington the last 5 years and has had the opportunity to work for some great organizations like Girls Inc. and the Monroe County YMCA. She has a passion for Superheros, dogs, and getting caught in the rain. During her time at SPEA she served as Graduate Assistant with IU Theatre and the SPEA Career Development Office, interned with the Children’s Museum of Indianapolis and the Indiana Arts Commission, and still had time to be the official, unofficial MAAA photographer. So that’s me, or at least the me that can be paired down to an introduction. Don’t tell my professors though because it is a terrible elevator speech. I wanted to share some of things I’ve been thinking about during this past month of travels. While this trip has been a treat/relaxing time for me following a super busy two years spent getting two Masters—it has also been a time for me explore lots of different cultural organizations in another country and put my arts admin hat on a in the real world. My first topic of discussion is…. Beautiful buildings that evoke a sense of grandeur and impressive, intimidating architecture. Many museums in Europe housed in elaborate and imposing buildings. I love the history of the buildings and the palaces that a lot of museums once were, but my favorite museums on this trip were the ones designed recently. The ones I have learned the most from were built specifically for the story they are trying to weave and the collection they have. The museum designs were an experience in their own right. I had never experienced a larger museum that was constructed specifically to tell the story of the museum. The Jewish Museum in Berlin, the Van Gogh Museum in Amsterdam, and the Titanic Museum in Belfast all had buildings constructed specifically to house the exhibits and tell the history of the Jewish People in Germany, Vincent Van Gogh and the Titanic, respectively. These museums are historical museums, built for a very specific purpose, and the layout helps communicate the story and enrich the symbolism of the space. Each of these museums was designed for their collection making the museums unique and the most comprehensive museum experience I have ever had. Places like the Louvre and the Uffizi have amazing works and the buildings themselves are stunningly beautiful with a rich history, but I get lost in the immensity and intimidating nature of them. These three museums led you at your own pace chronologically through the museum painting a holistic picture of the story they are trying to communicate. For me, there is far less “museum fatigue” and the desire to bounce around in museums that lead you through like this. The Titanic Museum was the first museum I had ever experienced having a building that was designed to create a museum for a specific historical event. Moving through the museum was an absolute pleasure. After seeing the first portion they send you to the fourth floor in a lift that looks industrial. This was a very pleasant way to transition from learning about making the ship to seeing how the ship was decorated and then how different classes’ living quarters varied. As you went down stairs you relived the sinking of the ship and finally about the rediscovery of the sunken ship. Every aspect of this museum layout was carefully planned. I was told I needed to visit this museum but was absolutely blown away when I entered the space. At first you enter a building that looks like any other museum, fancy stone exterior and intimidating height. You go through security and begin to make your way downstairs, soon you realize this is a museum like you’ve never experienced before. The building connects underground to another building and has three axes, the Axis of Exile, the Axis of the Holocaust, and the Axis of Continuity. Each of these axes serve different purposes. The Axis of Exile leads you down the hallway with the names of countries where Jewish people fled to during the Holocaust. The Axis of Exile ends in a garden designed to make you feel unbalanced and unsure. Walking through the sloped garden the pillars are both a support and a constant obstacle. It made me slightly sick to walk through, and that was the point. The symbolism of being disoriented in another country was apparent as people stumbled through the garden. The Axis of the Holocaust had possessions that once belonged to victims of the Holocaust and shared the people’s stories. The hallway ended with the Holocaust Tower which was an unheated tower, where the only light came in from a small slit high above you. If you were quiet you could hear what was happening outside. The experience of being so confined and isolated while still being able to hear the world carry on around you was surreal. The tower was haunting and even though I could leave at anytime it was as if I was frozen there. It was a very powerful way to end the hallway that displayed artifacts from some of the victims of the Holocaust. The Axis of Continuity was the main part of the museum. At first the staircase looked small, but as you approached you saw that it extended up about three flights. This is where the museum took you through various exhibits starting with early Jewish culture and discussing the contributions of Jewish people in Germany. The museum explored what it meant to be Jewish and German as well as how discrimination started and was prevalent throughout German history. My friend from high school Doreen came with me to the museum. It was interesting to discuss and view this museum with a German citizen. The tower again from the bottom. Very eerie. “He made art in spite of his illness, not because of it.” The Van Gogh Museum was very clear that his art was not because of his mental illness. Since Van Gogh is my spirit artist, and I too have suffered from mental illness, I greatly appreciated the museum discussing his mental illness and psychotic breakdowns but focusing on his drive and dedication as a painter as well as his attempts to get better. The museum was chronological, except for the very beginning. Upon entering the first floor you come face to face with the painter himself. A variety of his self-portraits line the walls. The museum introduced you to Vincent the man before introducing you to Van Gogh the artist. It was a great way to start. You stared at how he painted himself and viewed the pallet he used and then slowly worked your way through his art as he improved, discovered himself, and his own unique way of painting. Going through several floors watching his progress as a painter and hearing his letters to his family makes the ending a more tragic. Looking at the last painting he made before shooting himself leaves you needing more. It is a sobering experience, looking at the final works and seeing a man trying to find hope. The museum however does not end on this sober note. The last part of the exhibit are paintings from artists inspired by Van Gogh, you get to see his legacy. Seeing the impact he had on the art world is a perfect end to a rather sad story. 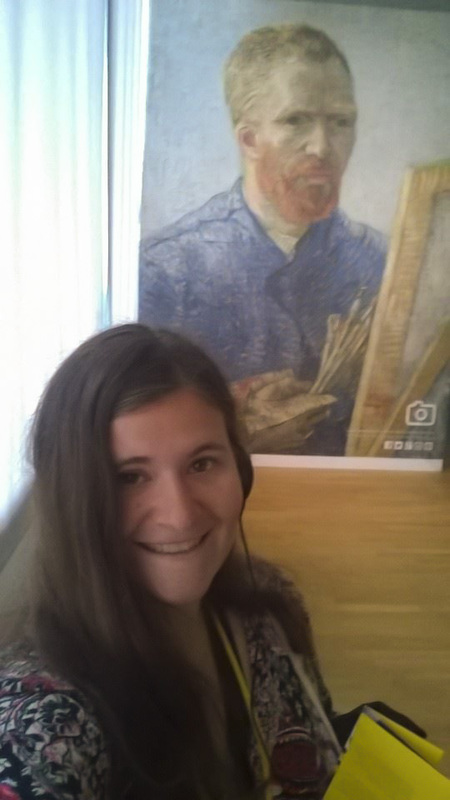 One of the only places pictures were allowed in the Van Gogh Museum! It might not work to design an entire art museum for a specific collection, when the idea of an art museum is to constantly grow and display lots of different pieces and exhibits—not necessarily guide people through a specific narrative. I have yet to find an art museum that tells a cohesive story in such a meaningful manner as these historically-focused museums. Perhaps only historical events can have these types of moving, narrative-focused museums built for them. 10 out of 10 Joelys recommend these museums! ← Congrats to the Class of 2016!